Abstract. Permafrost is a key element of the terrestrial cryosphere which makes mapping and monitoring of its state variables an imperative task. We present a modeling scheme based on remotely sensed land surface temperatures and reanalysis products from which mean annual ground temperatures (MAGT) can be derived at a spatial resolution of 1 km at continental scales. The approach explicitly accounts for the uncertainty due to unknown input parameters and their spatial variability at subgrid scale by delivering a range of MAGTs for each grid cell. This is achieved by a simple equilibrium model with only few input parameters which for each grid cell allows scanning the range of possible results by running many realizations with different parameters. The approach is applied to the unglacierized land areas in the North Atlantic region, an area of more than 5 million km2 ranging from the Ural Mountains in the east to the Canadian Archipelago in the west. A comparison to in situ temperature measurements in 143 boreholes suggests a model accuracy better than 2.5 °C, with 139 considered boreholes within this margin. 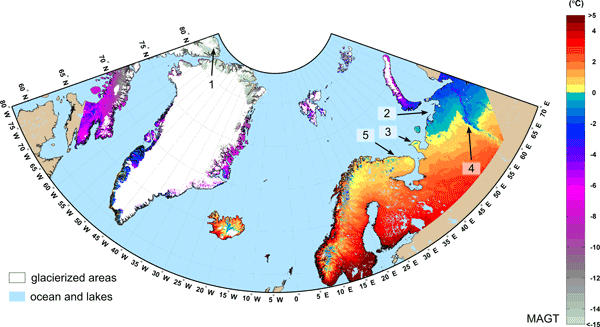 The statistical approach with a large number of realizations facilitates estimating the probability of permafrost occurrence within a grid cell so that each grid cell can be classified as continuous, discontinuous and sporadic permafrost. At its southern margin in Scandinavia and Russia, the transition zone between permafrost and permafrost-free areas extends over several hundred km width with gradually decreasing permafrost probabilities. The study exemplifies the unexploited potential of remotely sensed data sets in permafrost mapping if they are employed in multi-sensor multi-source data fusion approaches. 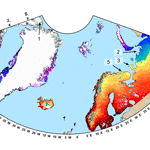 How to cite: Westermann, S., Østby, T. I., Gisnås, K., Schuler, T. V., and Etzelmüller, B.: A ground temperature map of the North Atlantic permafrost region based on remote sensing and reanalysis data, The Cryosphere, 9, 1303-1319, https://doi.org/10.5194/tc-9-1303-2015, 2015. We use remotely sensed land surface temperature and land cover in conjunction with air temperature and snowfall from a reanalysis product as input for a simple permafrost model. The scheme is applied to the permafrost regions bordering the North Atlantic. A comparison with ground temperatures in boreholes suggests a modeling accuracy of 2 to 2.5 °C.